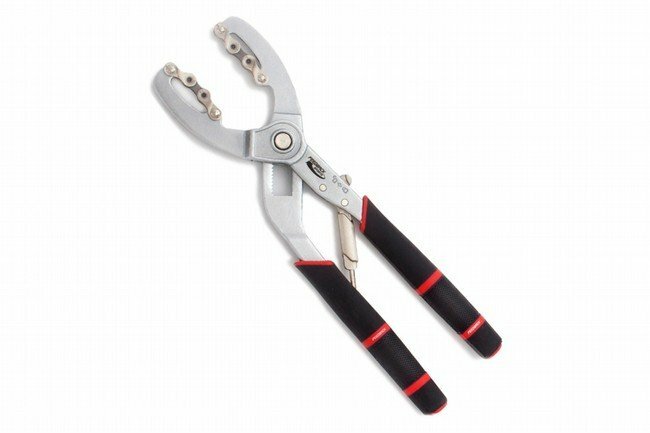 Feedback's Cassette Pliers offer a more secure alternative to the standard chain whip. They self-adjust for a strong hold on cogs on cassettes up to 12 speeds, and the file tread handles provide a comfortable grip for confident wrenching. I am not a great mechanic, and in the past have at times struggled with cassette removal using standard chain whips. I purchase the Feedback Cassette Pliers to replace a Performance Spin Doctor chain whip that snapped while I attempted to change a stubborn cassette. I've only used the Feedback Pliers twice, but it is noticeably more user-friendly and secure than the standard chain whips I have used in the past. Provides a really strong, secure grip. Highly recommended. Wow. This tool is easy to handle and makes cassette changes easy. Just place, squeeze and and no more worries about slippage of the chain whip and cuts on your knuckle. Makes cassette change very easy. One hand operation. Made well. I like it better than using a chain whip or chain wrench.